There's been alot of debate online about parenting because of Amy Chua's book The battle Hymn of the Tiger Mother. Most people are shocked and bewildered by the strict and tough upbringing she has apparently put her through. I laughed out loud when I read what most Americans and Europeans are calling tough. Perhaps, I should convince my mother to write a book. 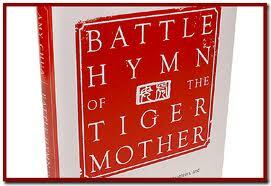 Now that will be a real Battle Hymn. It has whips, lashes and a whole assortment of treatment which if repeated would simply land her in jail in a country like the states. But am not complaining, in fact kudos to her. I have turned out alright (Government scholarship for University-check. Completion of said university-check. Job even before graduating-check) Not to say that this is the basis of whether one is on the right path but at least I have alot am proud of. And no, am not contemplating suicide because of the harsh memories I have. I have a pretty balanced social life. Good relationships all round. So I believe i have turned OK. And i have no one but my mother to thank. For every lash, every harsh word, every thing that even I sometimes thought was borderline torture. And so have the tiger cubs (Tiger mother's children). Check out the youngest's blog here. Well rounded child I must say. And yes, like my mum..I am not going to spare the rod. From the wiki article on the book, it seems like the a lot of the online debate has been sparked by posts that take excerpts out of context. The book is apparently of a mother’s journey trying to straddle two cultures’ parenting philosophies and realising along the way that too much tiger wasn’t the answer. In fact, Tiger Mom seemed more effective with her older daughter, Sophia, than her younger one. So she adapted, which is great. I think parents tend to forget that they really hold all of the cards – TV privileges, computer time, music, etc, etc. Spare the rod and spoil the child therefore now has more relevance in a metaphorical sense, I would argue, as reaching for an actual rod is using a sledgehammer to crack a nut – something that might not leave the contents in tact! It is said there are only two pains in the world: pain of discipline and pain of regret. The challenge for the parent is teaching the child that the latter is the worse pain. Thus, it is counterproductive if the pain of the discipline outweighs all else. Or, if regret is not understood by the child.